The BBC's weekly The Boss series profiles a different business leader from around the world. This week we speak to Ethan Brown, the boss and founder of vegan food company Beyond Meat. Ethan Brown's 12-year-old son eats a burger almost every day. "My son's getting clean protein… and no cholesterol," he says. "He's growing like crazy right now so I want him to have that protein." Mr Brown says he is on a mission to redefine the word "meat". The 40-something's Los Angeles-based business makes vegan burger patties, chicken strips and sausages from plant proteins. They are formulated to mimic the taste, texture and look of beef, chicken and pork. Stocks of the company's flagship Beyond Burger product quickly sold out after its launch in the US in 2016, helped by a positive article in the New York Times. Meanwhile, high-profile investors include Microsoft's Bill Gates, Twitter founders Biz Stone and Evan Williams, and the actor Leonardo DiCaprio. "There's no mystery to meat," says Mr Brown. "It's amino acids, lipids, trace minerals and water. "And if you can deliver those four things in the same blueprint or architecture as muscle - why can't that be called meat?" "We put together the best scientists on this [challenge]," Mr Brown says. "To understand meat more than anyone else in the world, and then painstakingly build it bit by bit using plants." Mr Brown spent all his savings on the venture, and raised money from family and friends. "I truly begged family members," he says. "It's amazing what you'll do to make it work." After repeatedly phoning grocery chain Whole Foods, "almost to the point of indecent behaviour", he says he managed to get a meeting that resulted in the store stocking the product from 2013. However, Mr Brown wasn't happy with the early recipes. "We got the vegetarians by the droves, but we didn't get the mainstream consumer," he says. "We had to go back to the drawing board." Along with improving the formulations, Mr Brown says that his biggest challenge was getting people to stop thinking of them as "fake meat". "I would never call it that," he says. "We don't call a mobile phone a fake phone - it's a better phone than a landline. We have to get people to think about it this way." The best-selling Beyond Burger patties "bleed" like beef burgers, thanks to the addition of beetroot juice. They also include pea protein, coconut oil and potato starch, and the company asks supermarkets to stock them beside the raw beef products in the chilled counters. The product is now stocked by 8,000 supermarkets across the US, and in thousands of the country's restaurants. In the UK it is being trialled at one branch of burger chain Honest Burger. It was also due to be on sale at supermarket chain Tesco from last month, but that has now been delayed until later in the year. Beyond Meat says it's because it was struggling to keep up with existing demand, both in the US and overseas. "[This] puts companies like Beyond Meat in a strong position to capitalise on the current interest in limiting meat intake," says Mintel's UK food and drink research director Kiti Soininen. But just how good, or otherwise do the company's products taste? A trawl of online food blogs show that the reviews are broadly positive. But while some reviewers say its burgers taste unnervingly like real beef, others say they definitely don't. 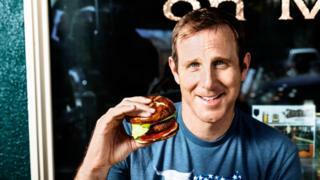 While Beyond Meat now has many rivals, including US start-up Impossible Meat and the UK's Moving Mountains, Mr Brown says that Beyond Meat is struggling to keep up with demand. "We're trying as hard as we can to catch up," he says. This expansion has been funded by external investment in the business that now totals $72m (£56m). Mr Brown won't reveal what stake he retains in the company, but calls it a "decent share". Mr Brown, who spent his childhood outside Washington DC, says he approaches every working day like it's an athletic event - eating well, exercising and meditating. At work, he admits, his focus is intense, and there's "not much chitchat time". "I tell my son this all the time," he says. "You're not going to get an extraordinary outcome if you don't put an extraordinary amount of work in."